Dinner should consist of protein and vegetables. Try to avoid carbohydrates at dinner time. Here are some recipes to help get you started on a healthy lifestyle. Heat sauce in a sauce pan until hot. Keep warm. Meanwhile, in a large skillet heat the remaining olive oil until hot but not smoking. Dredge the eggplant rounds in egg and then bread crumbs and saute until golden brown, about 3 minutes on each side. Continue until all the rounds have been browned. In a large baking dish, spread a small amount of sauce on the bottom and top with the golden eggplant. 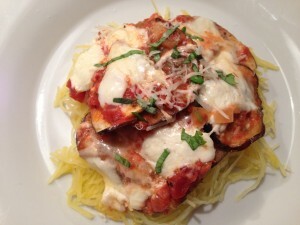 Apply sauce over eggplant and top with mozzarella cheese slices. Layer if you have extra rounds. Bake for 20-25 minutes. Place spaghetti squash on plate. Layer two eggplant rounds over squash and top with parmesan cheese. Preheat oven to 350°. In a large oven-proof skillet, heat olive oil. Add chorizo, onion, garlic and Swiss chard stems and cook over moderate heat, stirring occasionally, until stems are softened, about 5 minutes. Add the sauce, dried basil and crushed red pepper; simmer until thickened, about 15 minutes. Season with salt and pepper. Meanwhile, bring a large pot of water to a boil, add a pinch of salt and the Swiss Chard leaves. Blanche the leaves until just wilted, about 2 minutes. Drain and cool. When cooled squeeze all the water from the leaves. 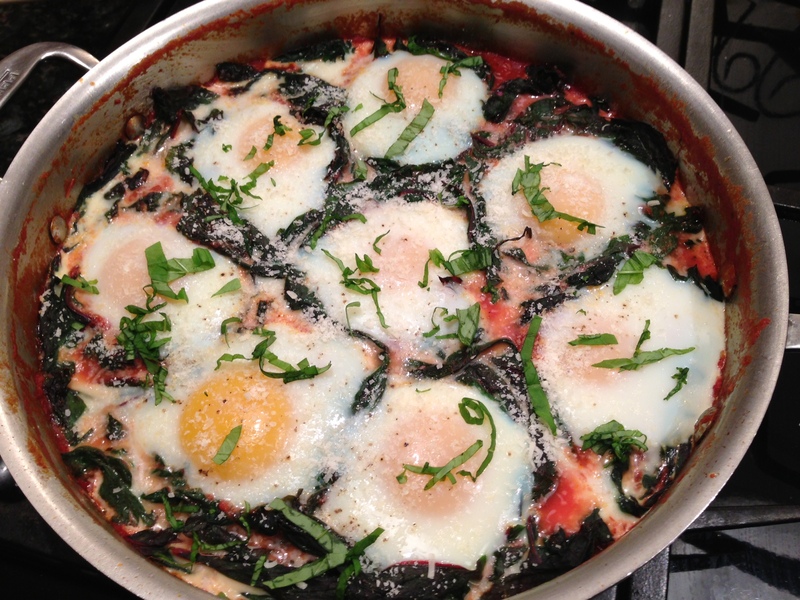 Arrange the leaves in the skillet into 8 round sections. Crack the eggs into the rings of Swiss chard. Transfer the skillet to the oven and bake just until egg whites have set, about 13-15 minutes. Remove from oven, sprinkle cheese over top and let set for 5 minutes. Sprinkle the fresh basil on and serve with crusty bread.